The garden kindly waited to hit its full summer stride until we returned from our trip. After a week of being creative with frozen veggies, I was ready! 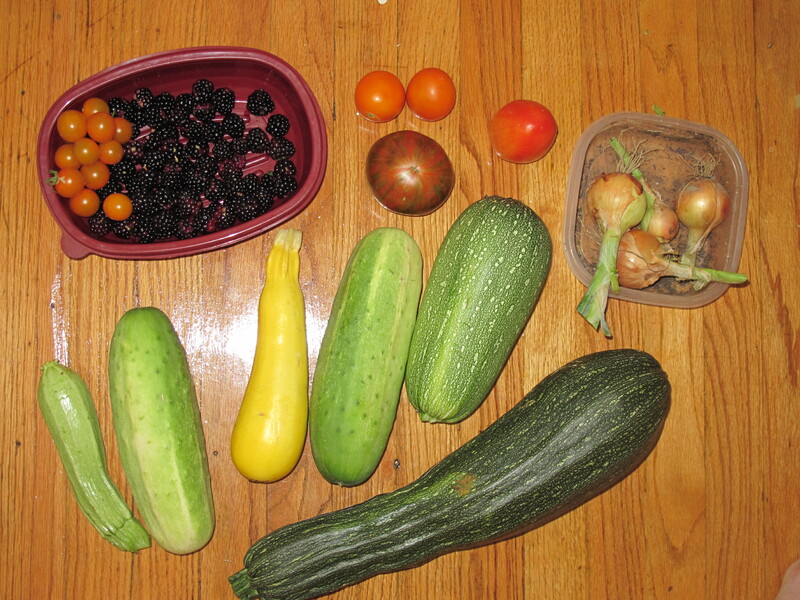 The zucchini on the bottom right got away from us, but it was perfect for zucchini bread. I whipped up a big batch and made some with chocolate chips as “cupcakes” for Sir’s belated birthday celebration with his childcare friends. After I made them, I had a bit of baker’s regret, wondering if three- and four-year-old kids would go for my healthy treat: no frosting, made with whole wheat pastry flour, and chock full of grated zucchini and chopped pecans. 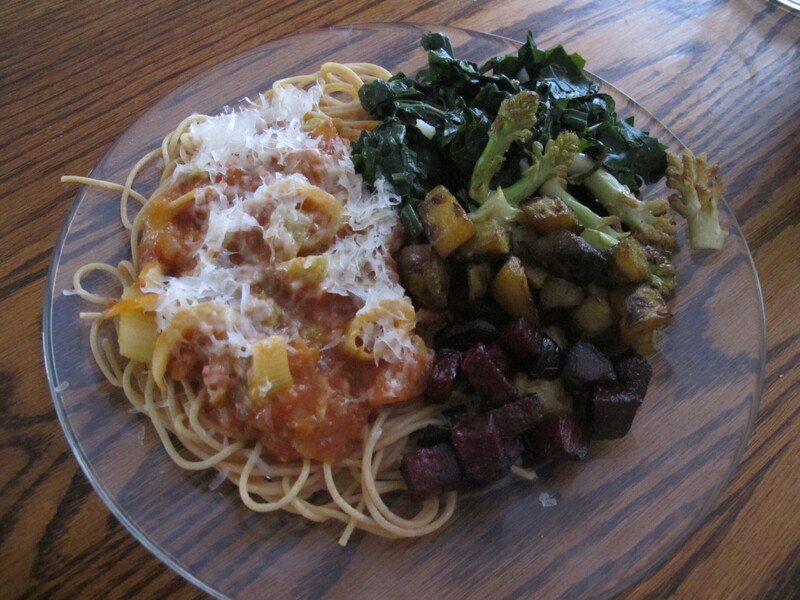 I made use of the hot oven to roast some veggies for dinner that night: red beets, golden beets, and broccoli romanesco, served with pasta with garden veggie sauce and a side of garlicky collard greens. Garlic featured prominently in the roasting marathon. 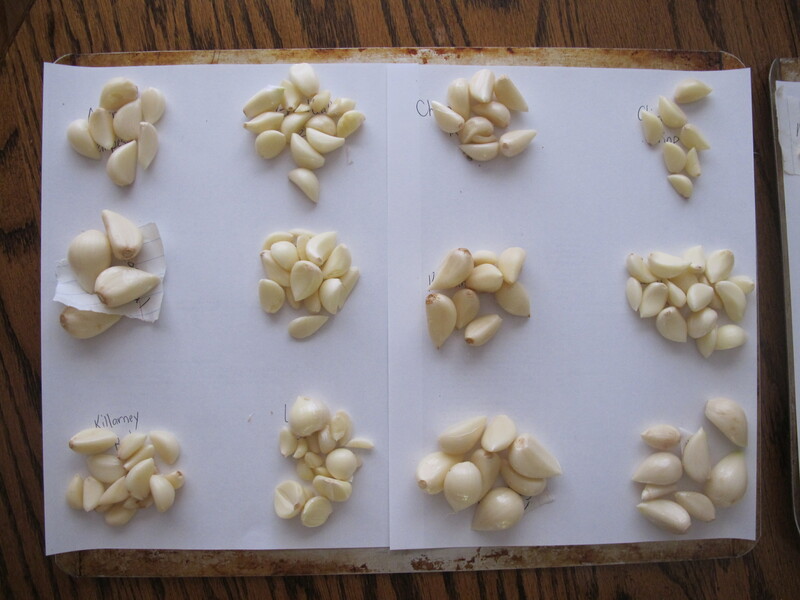 Matthew peeled hundreds of cloves of garlic for a taste test of the twenty-four varieties he grew. Unfortunately, my method of roasting the garlic in muffin tins, with individual varieties separated in the cups, and perhaps the fact that the cloves were already peeled, didn’t lead to the best roasting ever. Edible, just not that really delicious carmelization that you can get with roasted garlic. Matthew also sauteed several of the varieties to try them that way. After all that work, our general conclusion is that the different kinds all taste like, you guessed it, garlic! Another meal, this one inspired by a magazine recipe for pasta with anchovies, walnuts, and raisins, served with tomato-topped kale and cannellini beans, plus some sauteed squash. 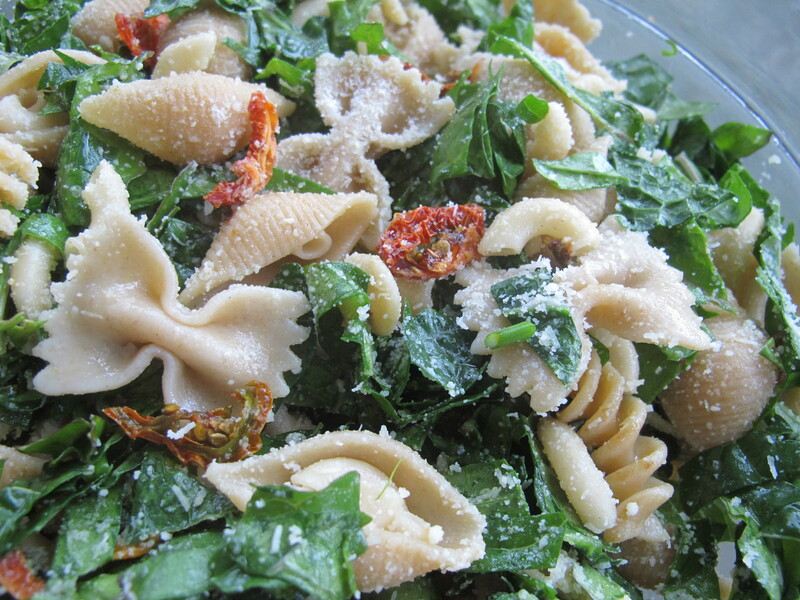 Finally, this dish was actually a pre-vacation meal: a simple pasta salad with [raw] kale, spinach, and last year’s sun-dried tomatoes, dressed in olive oil, white wine vinegar, parm, and salt and pepper. Some chopped olives would have made a welcome addition. Unpictured eats: quinoa and summer squash salad, gazpacho, lentil chili, and garden veggie curry. 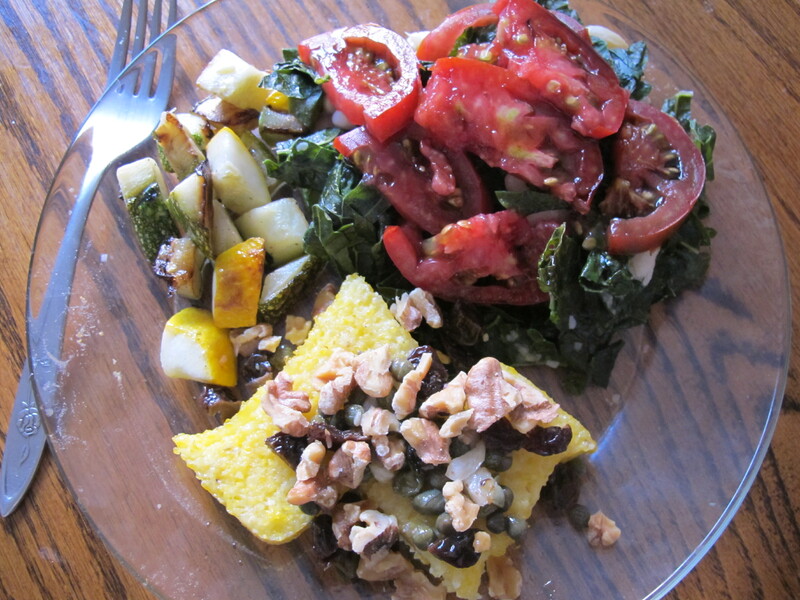 Stay tuned for some recipes, including more details on the polenta dish and a simple, refreshing cucumber salad. This entry was posted in Food, Garden, Recipes and tagged eat local. Bookmark the permalink.